The color, shape and the dimension in this Tumbling Block displays C Jean Horst's disciplined ability to arrange colors in a totally symmetrical way and yet produce a complex overall design. There are stars and three dimensional blocks, easy to spot with careful inspection. Also the blocks rotate around a small black star central to the quilt. The light colored top of each block moves as the blocks rotate around, forming a jagged circle. 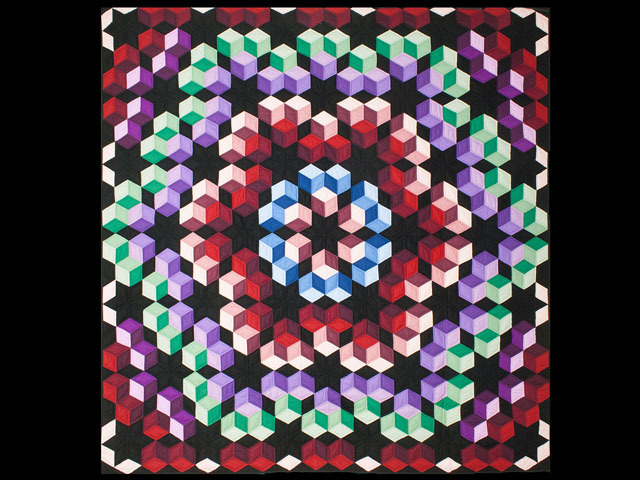 Perhaps the quilt gets its name from the multiple lines of symmetry that intersect and echo throughout, or possibly from the way the colored blocks seem to tumble out from the center black star. The quilting was done inside the blocks. 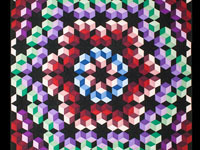 Squint your eyes and enjoy a somewhat different view of this kaleidoscope of color. ! Magnificant office wall or foyer piece. 100% cotton fabrics. Sleeve has been added for hanging or it could be used as a throw. This has 8 hand quilted stitches per inch and is well quilted. 100% cotton fabrics !